Wait. New Baeck. Guernica Editions. First Poets Series 18. Toronto - Buffalo - Lancaster U.K. 2018. Ned Baeck is down and out in Calgary and Vancouver. This sort of drinking and poetry and poetry and drinking is suicide. And from the edge of that precipice Wait mocks and provokes us. Baeck is bleak and dark and wounded and wild and out of that wolf sneer side of his lucid mouth he's spitting poetry daggers. Never has a poet so irritated, intrigued and impressed Today's book of poetry at the same time. It's like Malcolm Lowry and his doomed being "eloquent in their sinking." on a bright February afternoon. unwavering as I hurtle from the rail. gasping, voices calling me from shore. Man woman dog. Saw them as I fell. Claw cold water till I lose consciousness. People cover me like insects. I was in the river. emerging from the teeth of the earth. some of what we have in dreams. and fall apart without end. someone with a bag of groceries. Baeck probably does that just to see the look on our faces. Today's book of poetry thinks that Ned Baeck has arrived fully formed with a strong disposition. These poems ripple ripe because Baeck knows how to burn. and the dark a wilderness. a fire burning on each shoulder. its brusque gait like a thief's. or you know it doesn't matter. but there isn't much time. At least the dogsbody, empathy. watched over by bacchanals and Samaritans. its gruel of almost and elsewhere? Wait is unsettling, unnerving and totally necessary reading. This is not poetry that will make you happy—but you will be engaged. There are moments of tenderness and hope but you have to be looking for them. Today's book of poetry was deeply moved reading Wait, when it grabs you, and it will, it gets in deep, right next to the bone. rain or shine, winter, summer, slush or dust. and couldn't flesh it out. you'll die is much. It isn't. is hell, or at least anguished displacement. and the ingredients are still here. is enough to throw a person. for adulthood, maybe he longs like that. disappearing it into his shirt. the possibility of it all happening again. I haven't done it since. Today's book of poetry is trying to get back to normal operations but we fear we're going to be a little light on the ground for the near future. Milo, our head tech, and Kathryn, our Jr. Editor, have vanished. They left a short note that lacked any detail. They will be made to pay for it. In the meantime you might want to listen to Sir Tom of Waits, patron saint and holy warrior, start with his monstrously good "If I Have To Go." Today's book of poetry is certain that will put you in the perfect space for Ned Baeck's Wait. It's a trip worth taking. 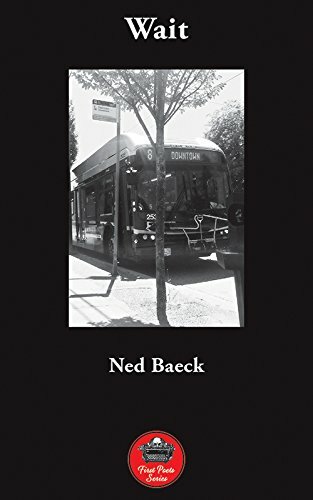 Ned Baeck lives in Vancouver. 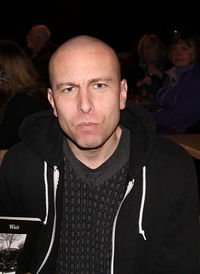 His poems have recently appeared in The Continuist, Sewer Lid, Prism International, poemimage, untethered, and Ottawa Arts Review. Wait is his first full-length collection of poems.